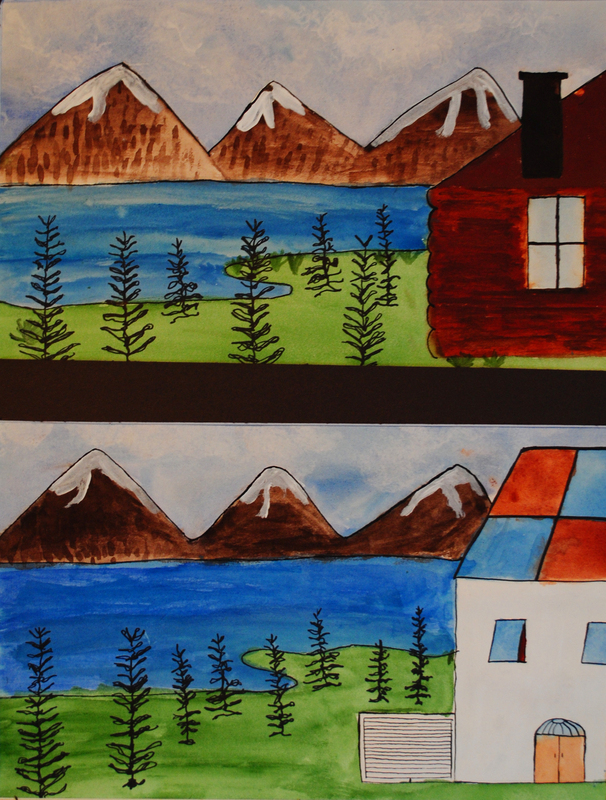 In the Fall of 2012 we had the great opportunity to work with students at Whistler Secondary School on a historical art project. 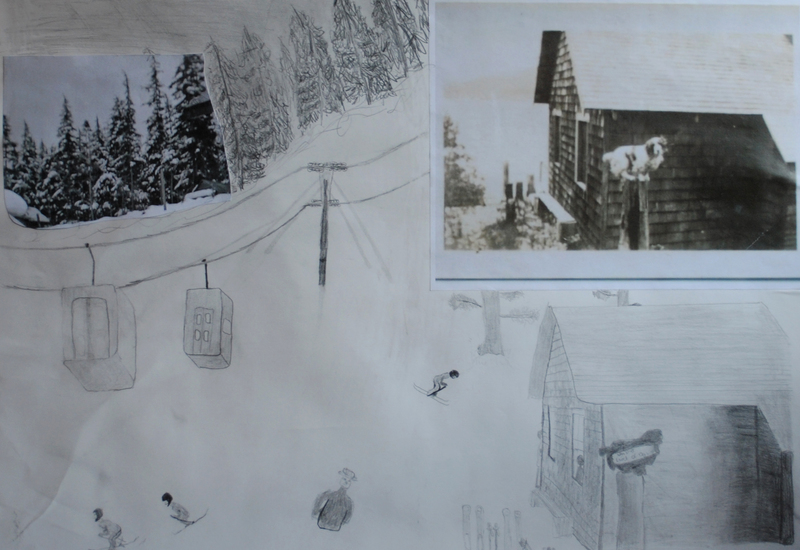 Students in Ms. Norrie’s Grade 10/11 art class were given 100 historical photographs from the Whistler Archives and told to produce a piece of art that made a statement about Whistler’s history. Other than that the parameters were wide open. Scroll for a more detailed look at the individual works, and the students’ thoughts behind their art. What historical aspect did you focus on and how did the image inspire you? I focused about how landscapes changed, also about the lifestyle and the houses where people used to live. 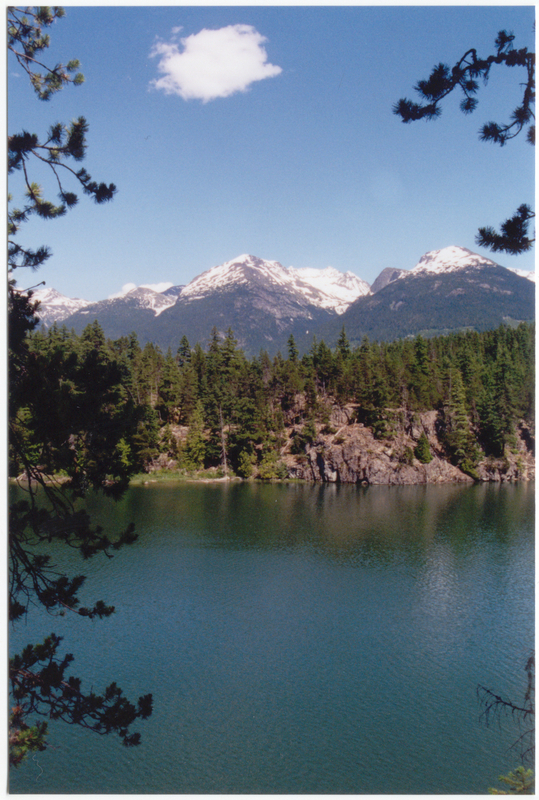 Kathryn’s inspiration: Alta Lake, no frills. How did you illustrate this visually? I panted in one side an old cabin in the middle of the forest with a lake just like the photo and in the other side there is a modern house and some different details. What historical aspect did you focus on and how did the image inspire you? I focused on the natural environment of Whistler. The original picture was in black and white, but I recreated it by painting it with colors to symbolize how diverse Whistler has become. 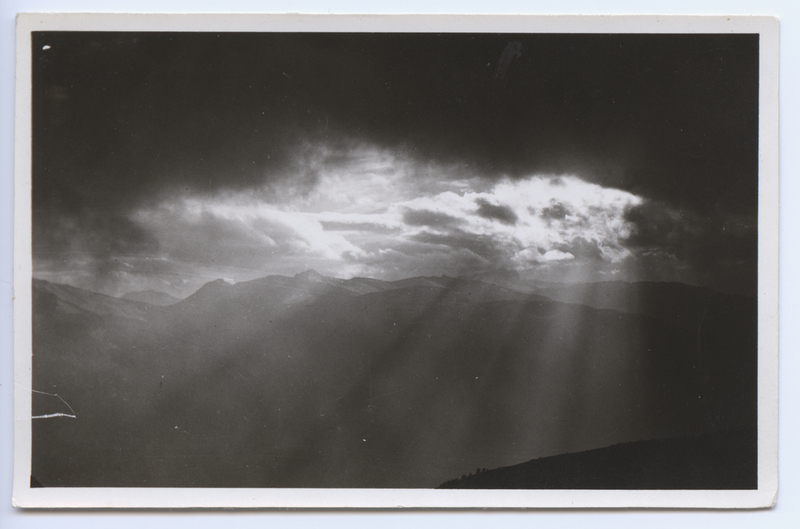 I find the nature of Whistler very fascinating, so this project has inspired me a lot. 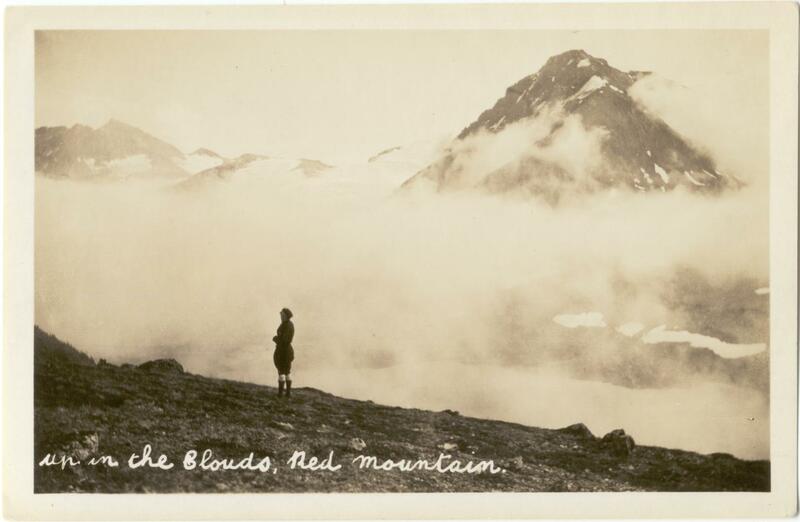 Amy’s inspiration, a picture of Myrtle Philip in front of Red Mountain (Fissile) on a 1927 hike. How did you illustrate this visually? 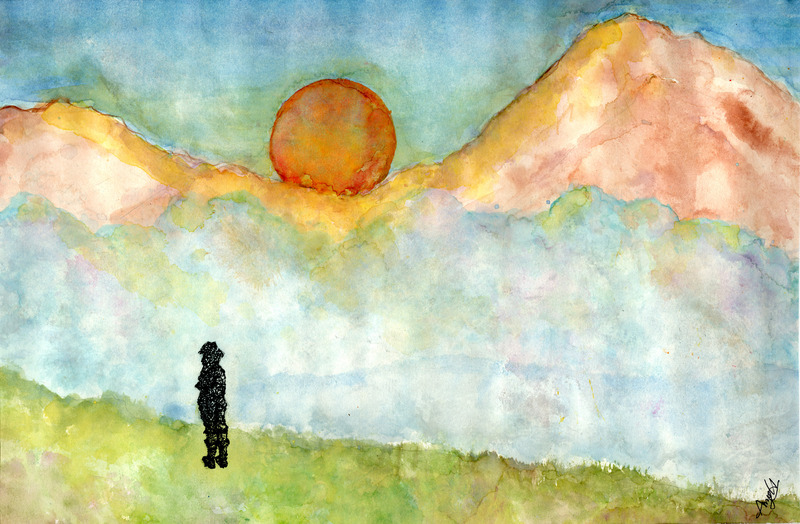 I used watercolor to recreate this piece. And I stippled Myrtle Philip standing on the mountains with a marker. The intensity of her silhouette against the soft colors of the background symbolizes the importance Whistler’s history. This painting is full of colors to show the ever-changing, natural beauty of Whistler and its community. It is a place full of excitement and fascination. Your final thoughts? I really enjoyed working on this project. Whistler’s history is a very interesting one. I put a lot of effort into painting this, and I am really happy for how it turned out. What historical aspect did you focus on and how did the image inspire you? I focused on the skiing and the huge progress in the mountains and the work put into it for the sport. What inspired me is the beauty of nature and how it never changes. 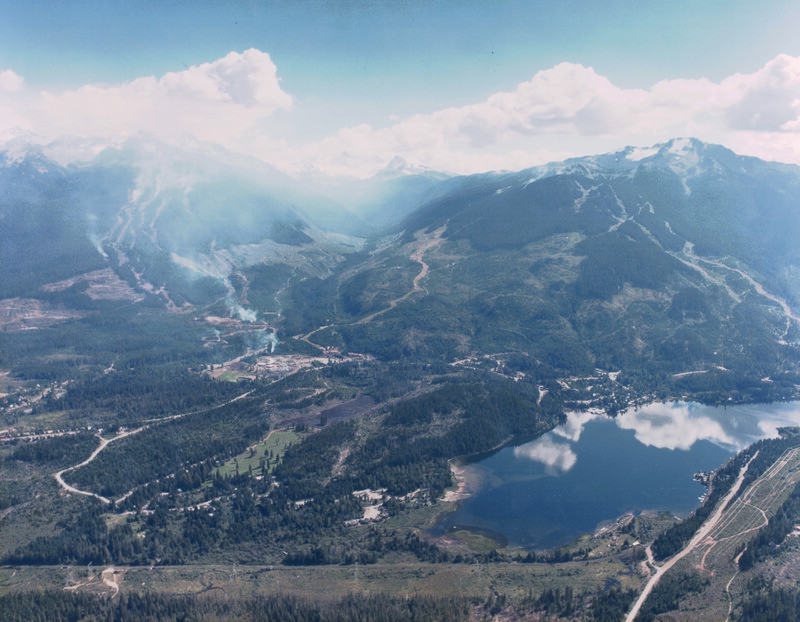 Melissa’s inspiration, an aerial photograph from the early 1960s of a pristine Whistler Mountain, not a lift or track in sight. How did you illustrate this visually? 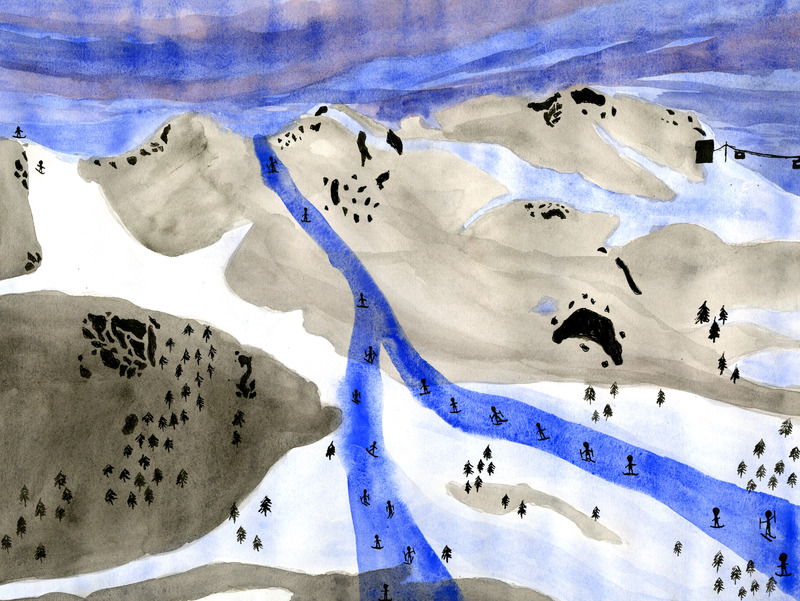 I painted this picture in watercolour and added the new ski runs, gondolas, people skiing/snowboarding and a chair lift to make it modern, but the mountains never change. I also did this in colour instead of just black and white. What historical aspect did you focus on and how did the image inspire you? I saw the mountains and the new buildings in the front and thought how could I change this picture just a bit to show how Whistler looks today. 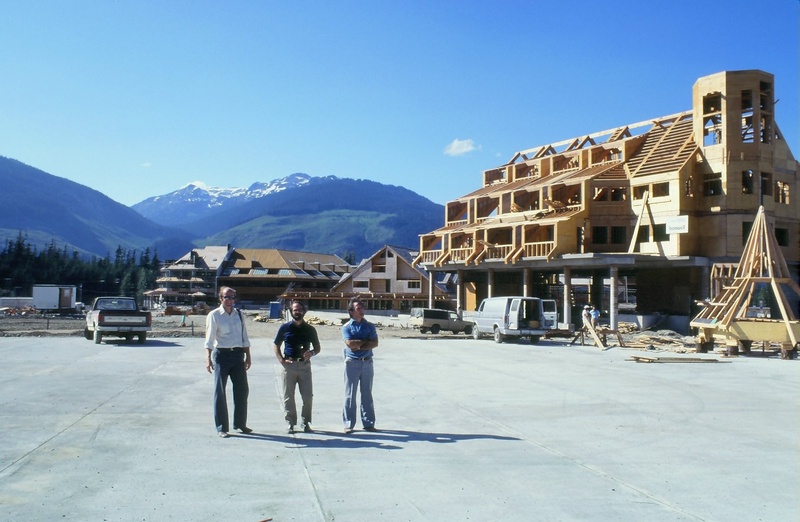 Mika’s inspiration: Whistler Village under construction, late 1970s. How did you illustrate this visually? I just changed a bit of the picture. The building next to the people is already built, and they look like that they are talking about it. Also I drew more threes to show how Whistler looks today. Your final thoughts? I’m not entirely pleased with my drawing but I think my illustration and idea was good. What historical aspect did you focus on and how did the image inspire you? 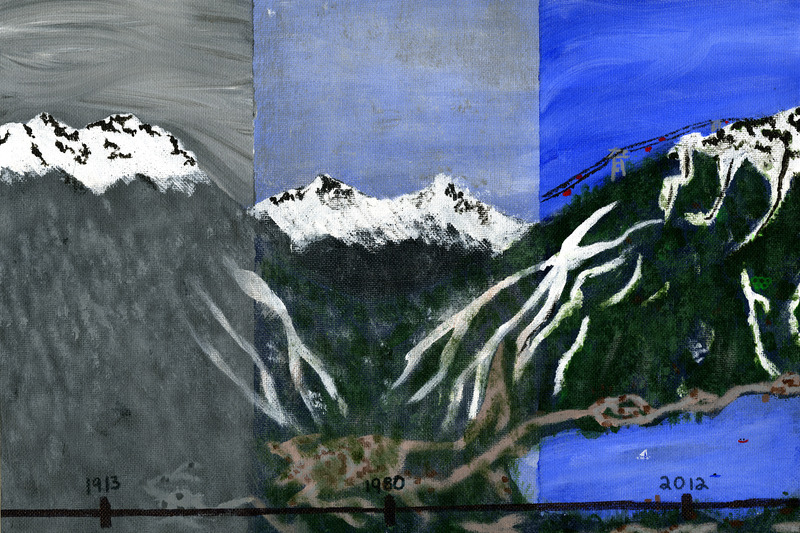 I tried to focus on the development of Whistler and its mountains throughout the years. How much has changed and how much is still the same. 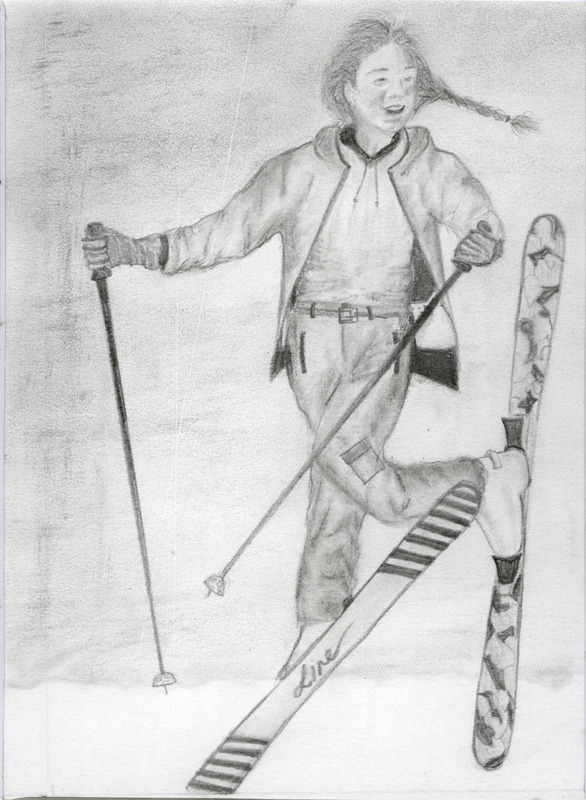 I mainly focused on the mountains and how it grew to become more of a ski resort than just a mountain. When I saw this picture of the mountains and Whistler as a whole, it gave me this idea of showing the development of this beautiful town I live in. when I was being given the presentation on what our project was going to be, I had a basic idea of what I wanted to do, but when I saw this photo, I knew that this was what I wanted to do. 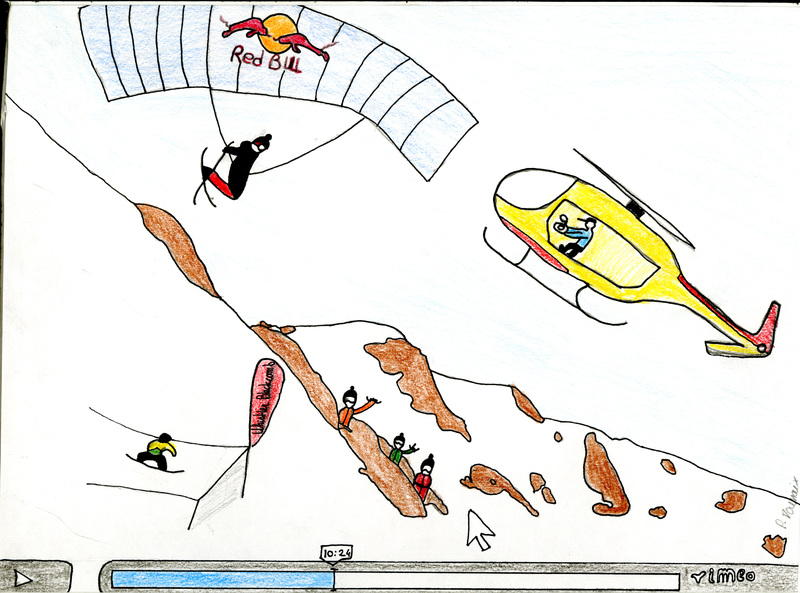 Emina’s inspiration: An aerial view of the Whistler Valley during the 1980s development boom. How did you illustrate this visually? I drew the mountains as if it was a timeline to show the difference through time, but with the same image. The further back in the years it goes, the less development it has and the colours start to fade. On the more recent side of the painting, the colours are more vibrant and definite. Also the development of the town is more recent and modern ie} Peak-to-Peak. Your final thoughts? I have never been a good painter and I have never really enjoyed painting so I decided to challenge myself with this piece. Overall, I’m quite happy with my piece, but there are little details that did not go the way I wanted it to. I think it was good that I challenged myself into painting this piece because I have learned quite a bit with the technique and how the paint works with the paper. It was a good experience. What historical aspect did you focus on and how did the image inspire you? I wanted to focus on the large change in technology and a smaller change in the landscape, because Whistler is known for many things, one is its mountains, and I want to show that even though Whistler has become a popular ski resort. Some mountains still remain untouched. Uriel’s inspiration, the original Creekside Gondola. How did you illustrate this visually? For my piece I don’t want to change it, I just want to put it into black and white and expand the picture to draw the present. So I decided to use this picture to show the difference from past and present. 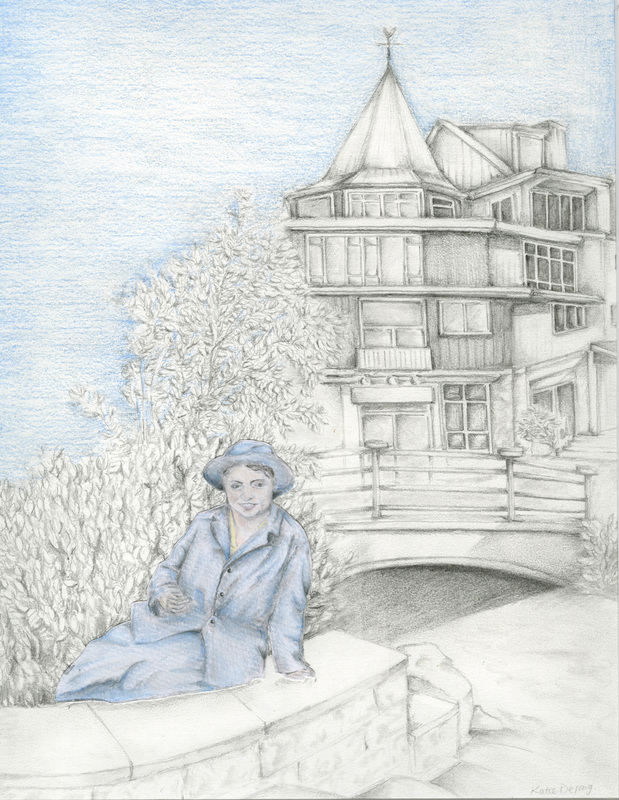 Past is in black and white (pencil) and present is in colour (pencil crayon). What historical aspect did you focus on and how did the image inspire you? 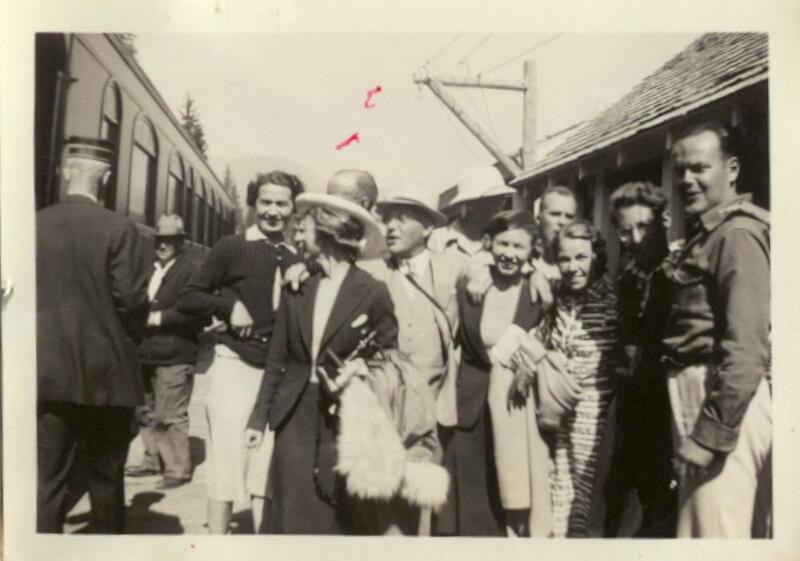 The historical aspect that I focused on was the coming of the trains and having fun. 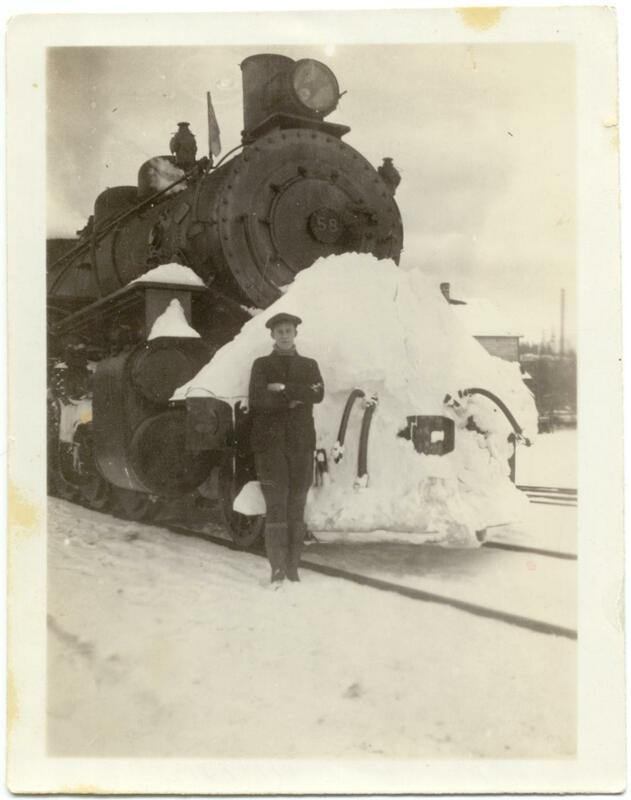 Jacob’s inspiration, the original PGE train with a snow-coverd “cow catcher.” 1920s. How did you illustrate this visually? 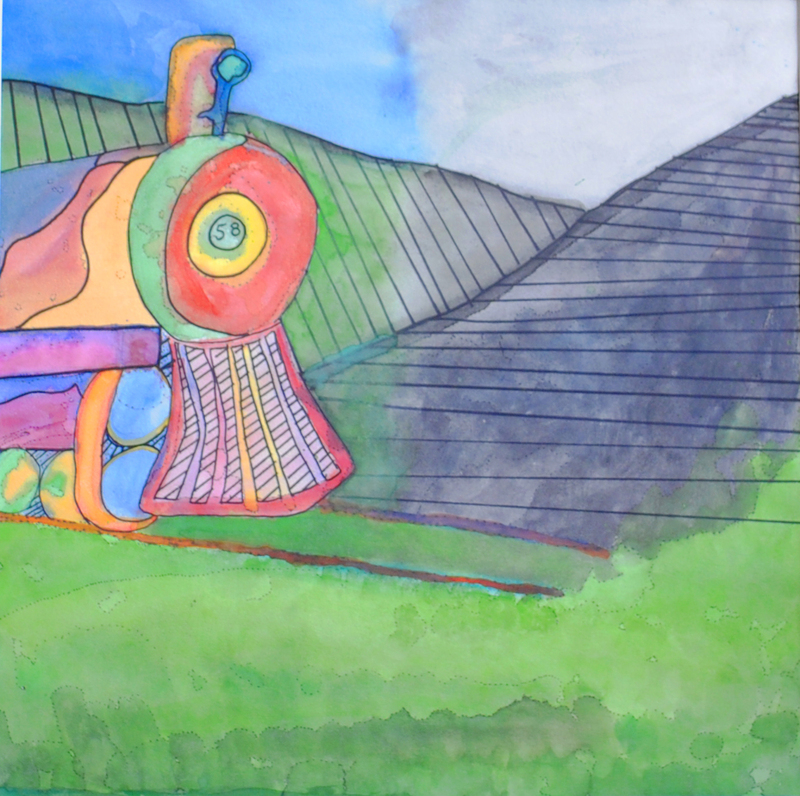 They way I illustrated this in my paining was the colorful train representing the new and the black and white that represented the old. Your final thoughts? My final thoughts are that I am happy with the way it came out and I like how I represented the new and old aspects of it. What historical aspect did you focus on and how did the image inspire you? Whistler always has been a village with a lot of tourism. On the picture is a part of Rainbow Lodge, in front of the house is a dog, which remembered me, that Whistler is a land of dog. For my picture, I thought about another kind of tourism around Whistler and decided to use the House from Rainbow Lodge as a House in the Skiing Area, which made Whistler World-famous. Nils’ inspiration: Binkie’s balancing act. How did you illustrate this visually? I tried to make the old skiing area clear, with an old-fashioned ski gondola and the house, which obviously was not build in this century. Your final thoughts? 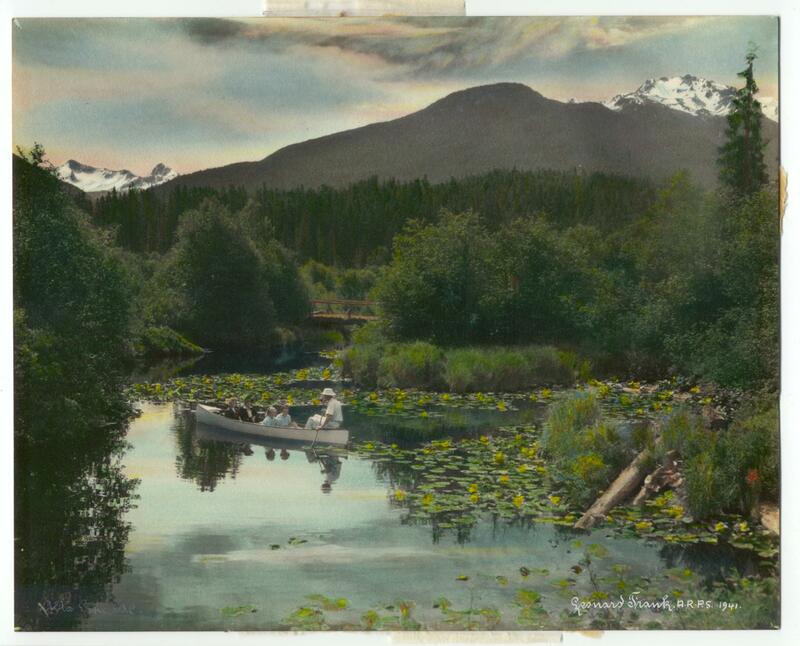 Even if Whistler’s history is not really long, it is an interesting and special one. Nearly no other village was so developed by tourism. The first buildings were part of Rainbow Lodge and today most jobs are in the tourism industry. What historical aspect did you focus on and how did the image inspire you? I wanted to show how Whistler always has been a place for activities, no matter who you are. Skiing, ice-skating, fishing and canoeing has always been a big part of Whistler, and is one of the main reason people still come here today. 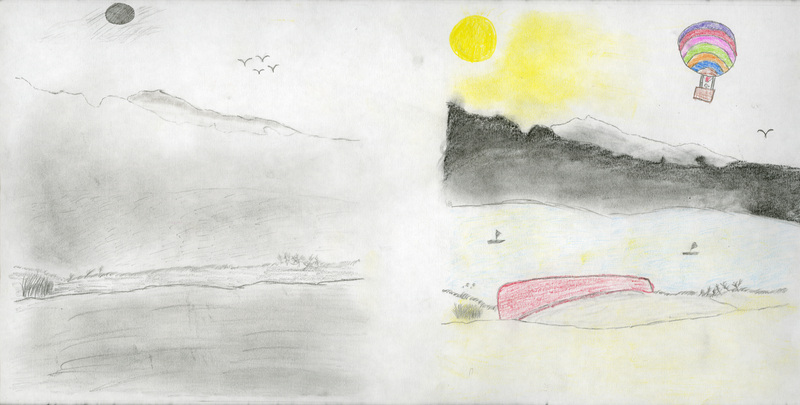 Truls’ inspiration: a valley bottom lake scene. How did you illustrate this visually? 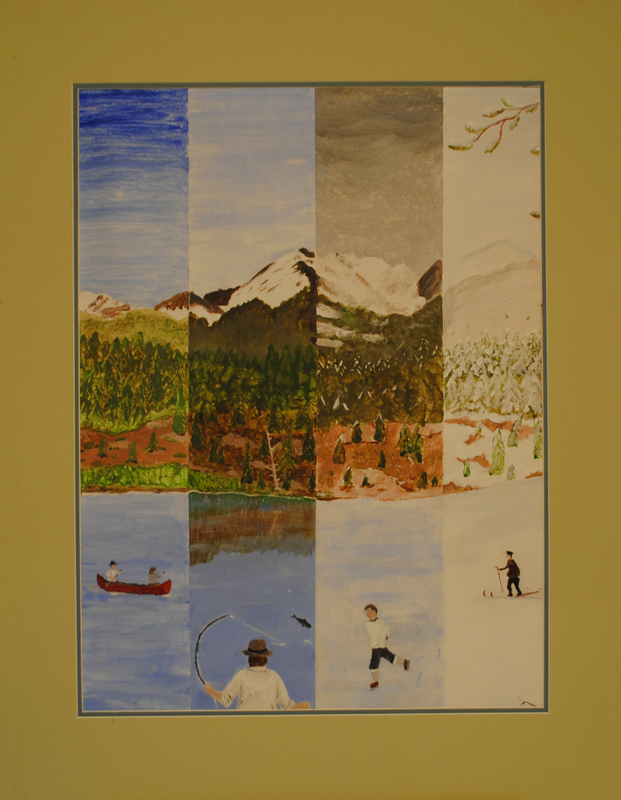 I chose to divide the picture into all the different seasons and add some of the most common activities into each season. Using many pictures I created people with the same style of clothes and gear as they had before. Your final thoughts? I think the painting turned out good. The paint job may not be perfect, but it ties itself a bit together. My favorite part about the picture is the man cross-country skiing in the bottom right corner, with his big belly. 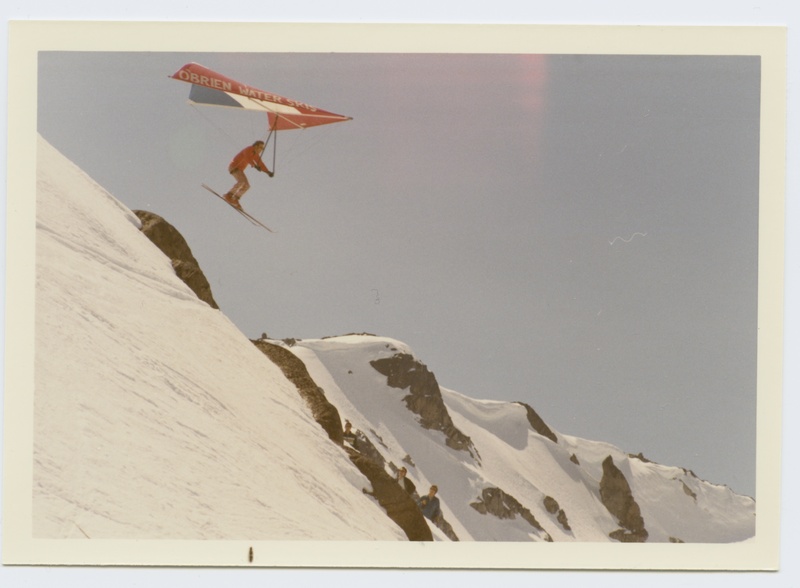 Rebecca’s raw materials: a collection of iconic retro-ski imagery. How did you illustrate this visually? I illustrated it by cutting them up in strips and pasting them on a piece of paper. 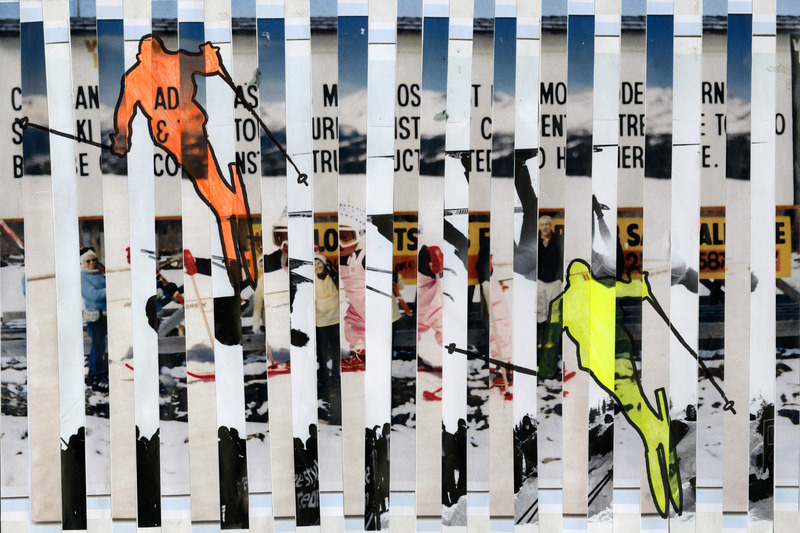 I also painted two skiers on top of the strips of paper in bright, vibrant colors. Your final thoughts? I like how my finished project came out. 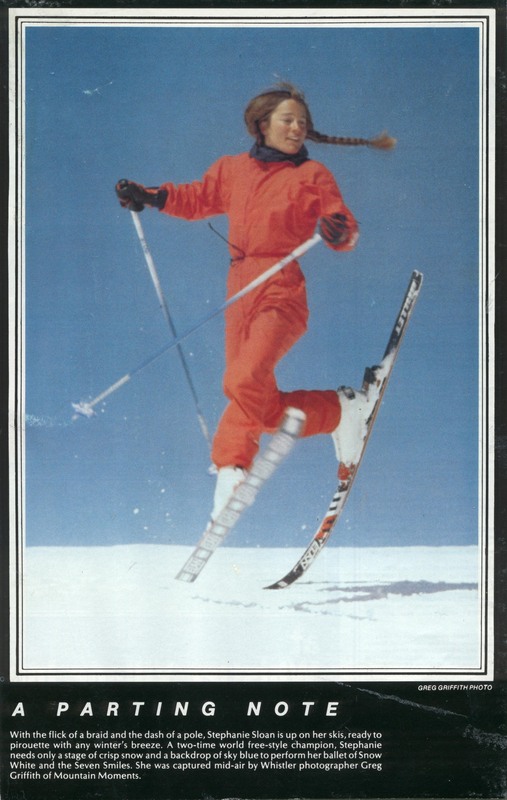 I really wanted to show some iconic moments of skiing and I think I did. What historical aspect did you focus on and how did the image inspire you? I focused on the different lodges that were around at the time taken in this photo, and the later buildings of Nita Lake Lodge (in particular). When I saw this photo, I pictured all the different people that came to whistler and were able to stay in the lodges that resided along the lakes. Also the winter activities that people used to enjoy and still do to this very day. 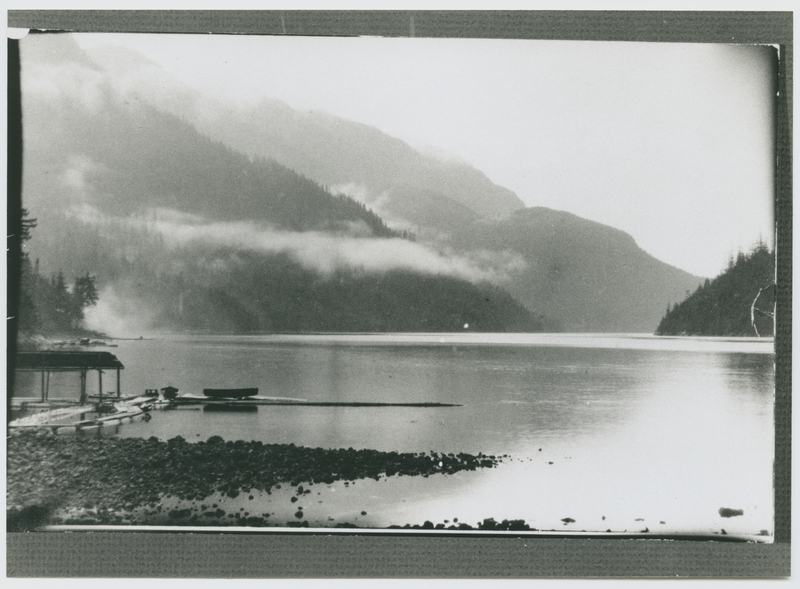 inspiration: a misty Alta Lake morning. How did you illustrate this visually? I thought it was a good idea to contrast the differences between old and new by giving one of the skaters newer equipment than they had back in the day, also the fact that Nita Lake Lodge now resides on the edge of the lake above (Nita Lake). Your final thoughts? Overall I am happy with the outcome. 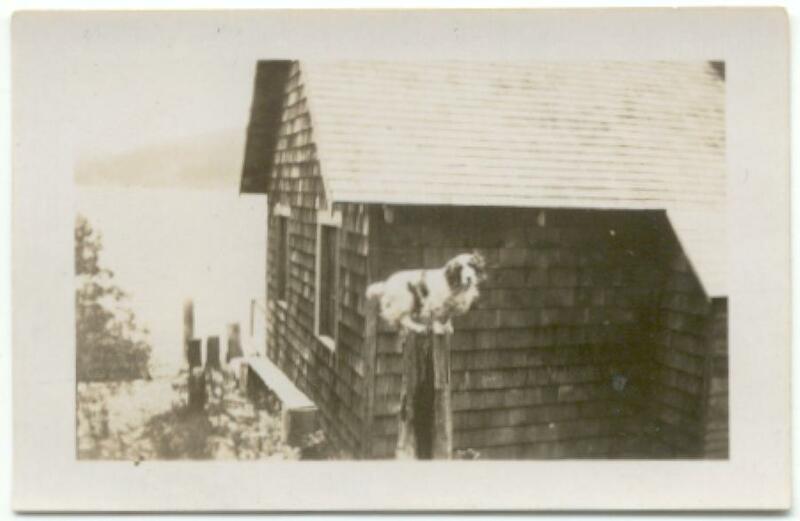 Mainly because I managed to stay true to the photo and I also managed to incorporate Nita Lake Lodge well into the photo. I felt it was a tad more serious piece than I would usually have done but still feel it portrays the photo nicely. What historical aspect did you focus on and how did the image inspire you? I was focused on the change of the society in Whistler. The types of people who come to Whistler and their houses have changed very quickly. The history here is not finished; it is still changing, because everything here is very new. This image inspired me because there is still a lot of new construction. 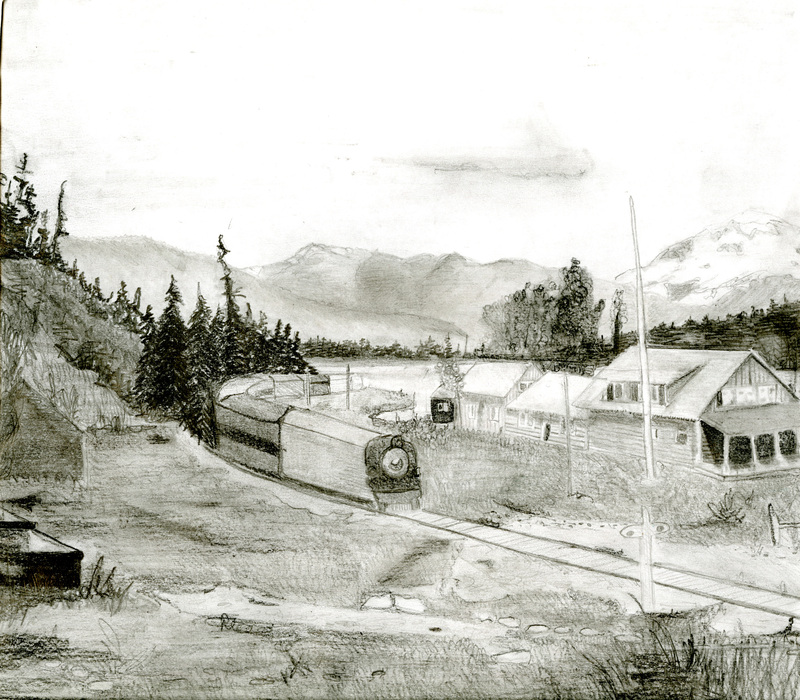 Luise’s inspiration: A southbound PGE train pulling in to Rainbow Lodge. How did you illustrate this visually? I didn’t change the landscape to illustrate that the landscape is still the same. I changed the houses to show that this is an area that changes along with society. To illustrate this, and that it has been a very quick change, I put the train in the middle. Your final thoughts? 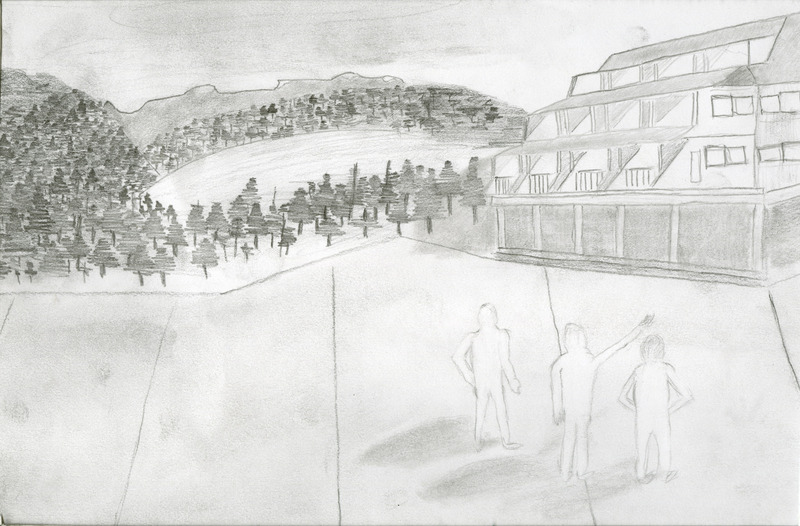 I really like this project because you can show your own understanding of Whistler’s history. What historical aspect did you focus on and how did the image inspire you? 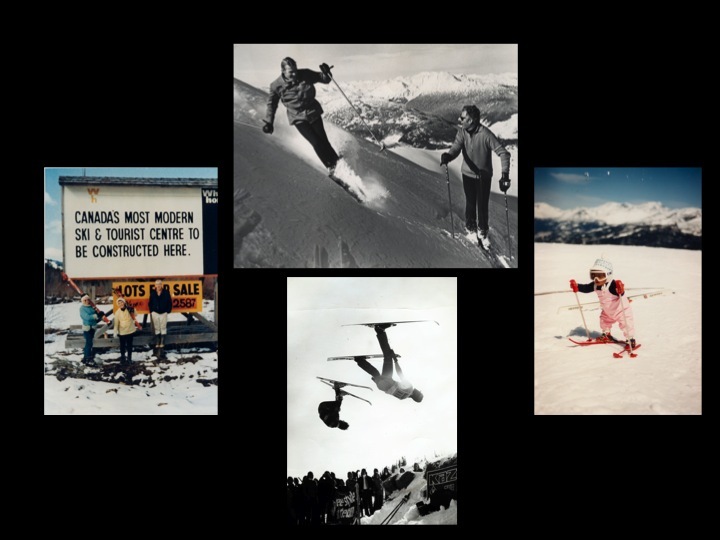 The historical aspect I focused on is the evolution of the skiing and the snowboarding during the couple years and the commercial part of what there is now in skiing and the snowboarding with the sponsors and the brands. The image inspire me because we can now see this landscape in a snowboard/ski movie. 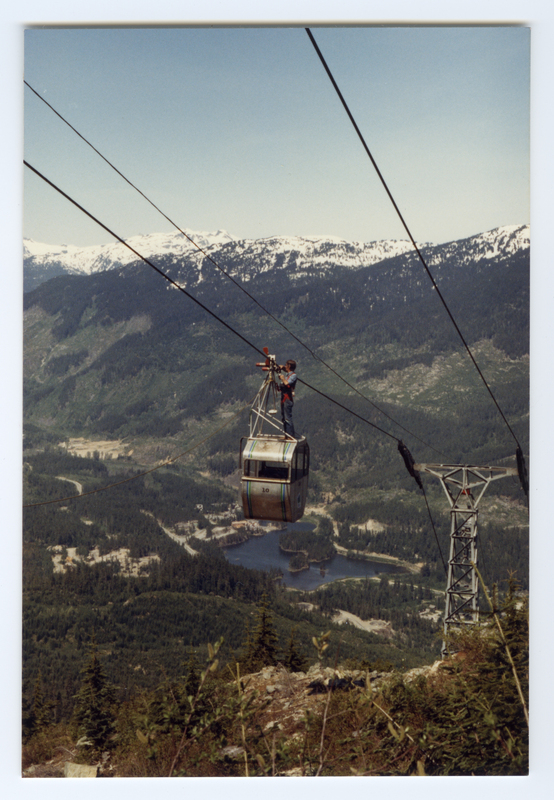 Paul’s inspiration: a hanglider on Whistler Mountain, sans madia circus, 1970s. How did you illustrate this visually? I drew the same picture but more modern. Your final thoughts? I think it’s good, it’s exactly what I would like to represent. What historical aspect did you focus on and how did the image inspire you? When I saw these images I just saw how although the people have changed all around Whistler, the beauty of the town with the nature and the mountains hasn’t changed. They are still as beautiful as ever! How did you illustrate this visually? I redrew two of the older pictures in colour so you could interpret them better. Then I put some original copies on the board. Then I put some of my own pictures that I have taken over the years to show that the beauty hasn’t changed much. Jacs’ inspiration: A dramatic late afternoon sky. Your final thoughts? I really like how it turned out. I really like how I can use some of my own pictures to showcase the beauty of Whistler! What historical aspect did you focus on and how did the image inspire you? 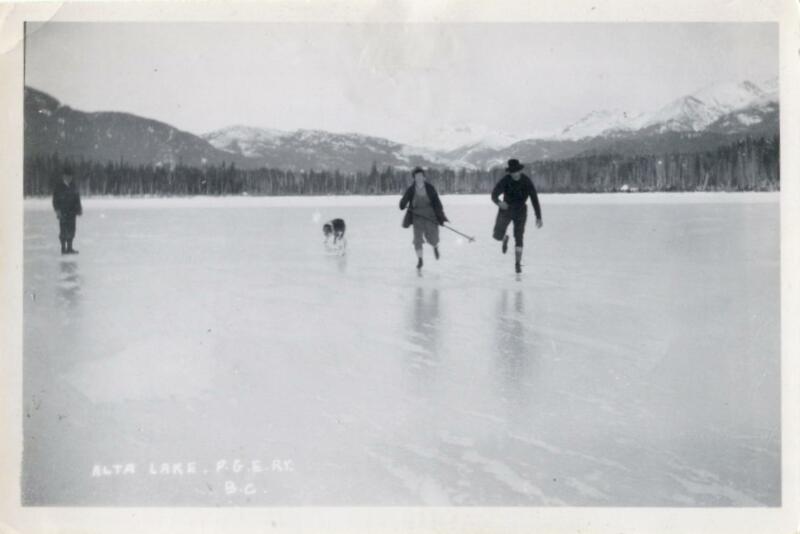 Before every person or lodge was in Whistler there were the lakes and the mountains. At that time no one could know that big city would be built here. This is a great image. It shows so much nature with the lake and the mountain. The fog and the wet grass makes it special. It shows the whole nature. 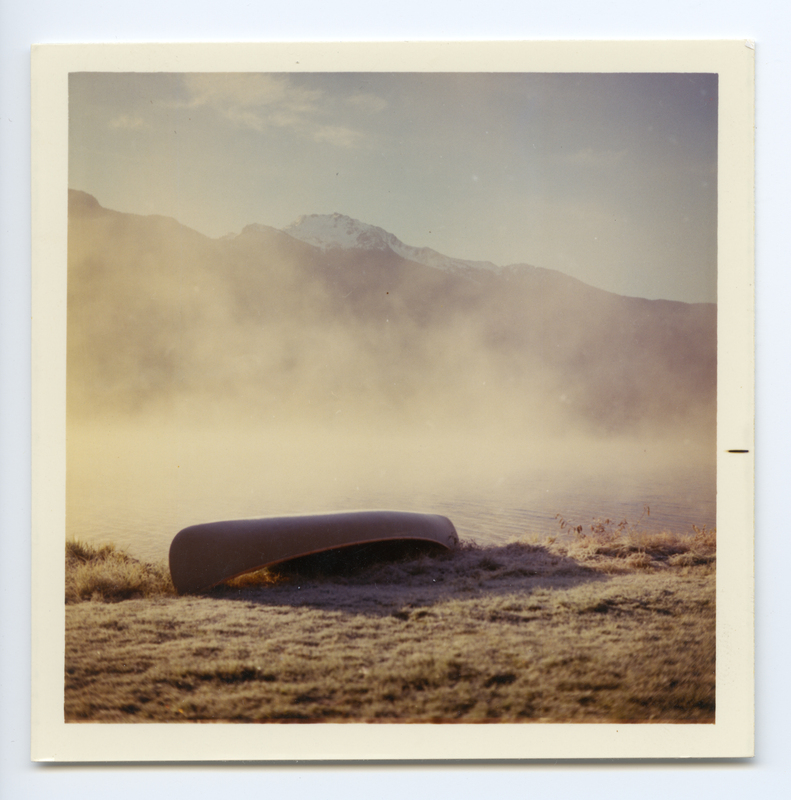 Michael’s inspiration: A misty Alta Lake morning, and an inviting canoe. How did you illustrate this visually? I tried to illustrate it in 2 parts. The first one without the boat and only the nature with the fog. Like it was 200 years ago. With the second picture I tried to show the lake and the mountains like it is today. With people and tourism. Your final thoughts? 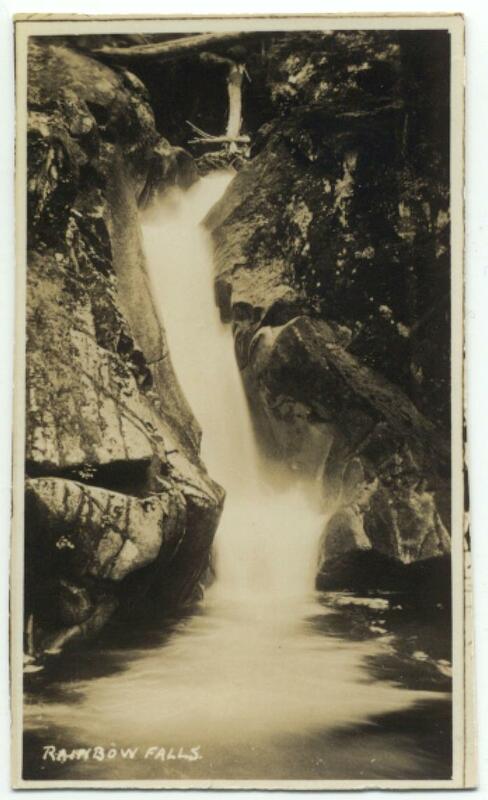 Whistler was only nature at first. One person once had a great idea, to build a city. Now nature and people come together here and I think it’s good. What historical aspect did you focus on and how did the image inspire you? I focused on the aspect that Whistler has changed a lot but Myrtle Philip was still one of the first people to really have a big effect on Whistler. She may have been a fisherman, hunter, etc, but I decided to put her in front of the village in my version to portray that maybe there was once only a log cabin but now in Whistler there is a whole village, and it is partly thanks to Myrtle. 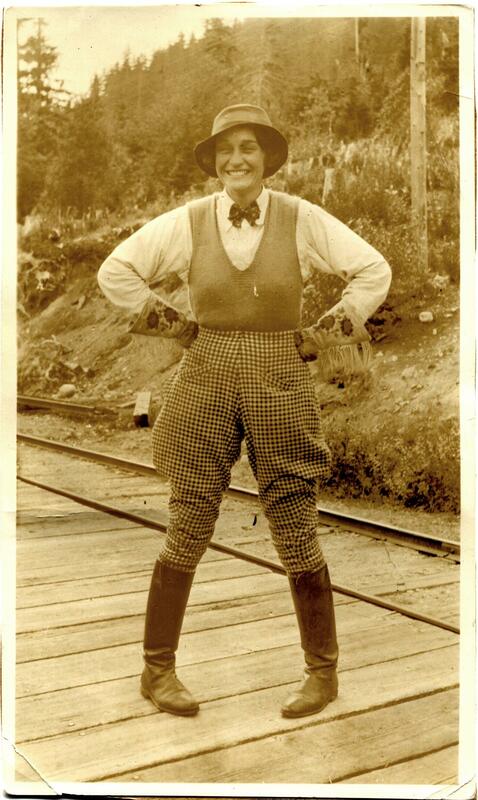 I was inspired by Myrtle because she was a strong pioneer and is a model for modern day women. 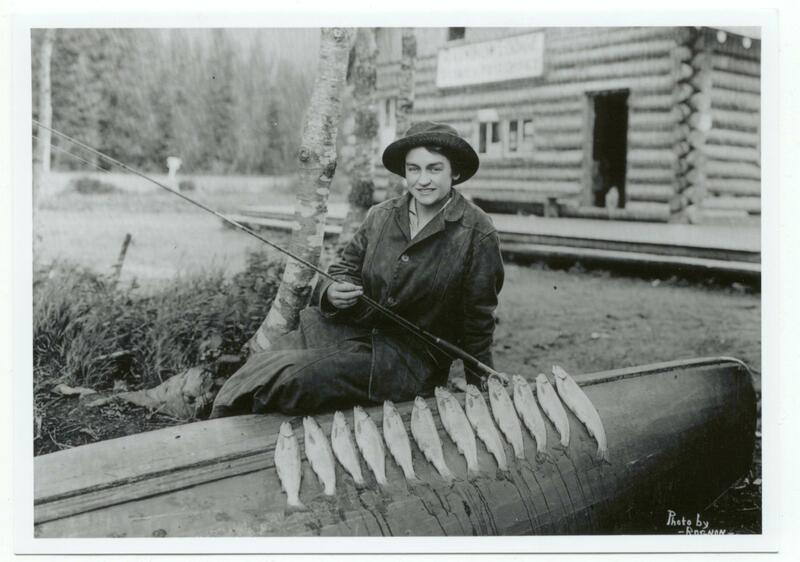 Katie’s inspiration: an iconic shot of Myrtle Philip showing off the day’s catch. How did you illustrate this visually? I sketched this drawing in pencil of the village from a photo that I took. I decided to put Myrtle in color because it shows her personality better and makes her stand out. Color has also been added to the sky to bring out the color in Myrtle’s clothing. I left her in her old clothing to symbolize the old Whistler. In the old photograph there is also a log cabin where the village is now, and on the left-hand side of the photograph there are trees and forest in the back, which is similar to my version. Your final thoughts? I am pretty happy with how my image turned out. I enjoyed this project because it has meaning and history behind it. What historical aspect did you focus on and how did the image inspire you? I focused on the historical aspect of the sign and the new beginnings that Whistler has had to endure. When I saw this picture I thought of how much fun and new exciting things were to happen in this little valley. Whistler will from now on always be a place for fun and adventure. 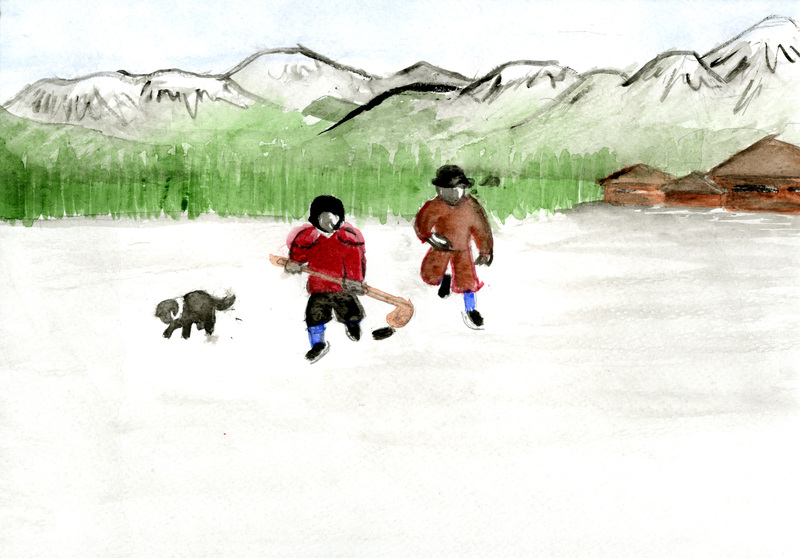 Savanah’s inspiration: Whistler’s humble yet auspicious origins. How did you illustrate this visually? My illustration shows Whistler from the ground up (garbage bags, to the village, to the mountains with the peak to peak) starting as it first was to what it is now. 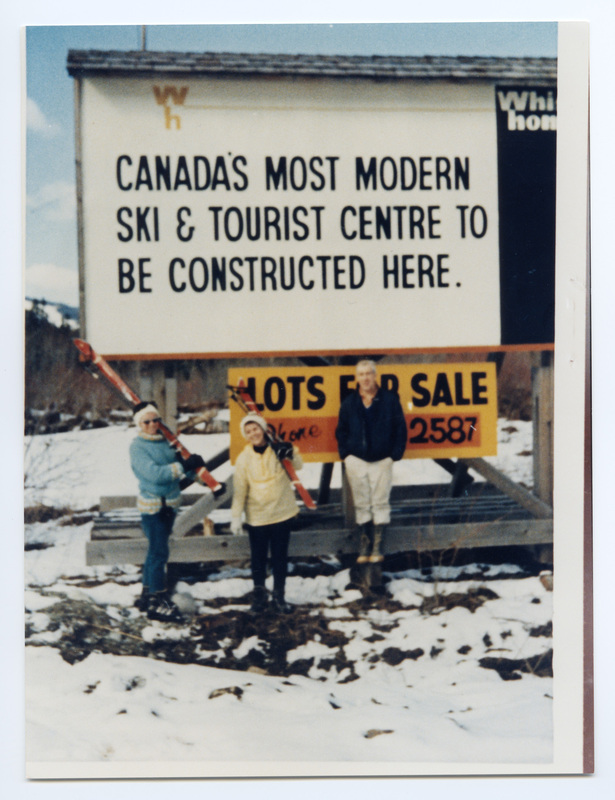 I decided that showing what the Whistler village used to be (a dump) was a good way to show old and new through this art project. Final Thoughts? 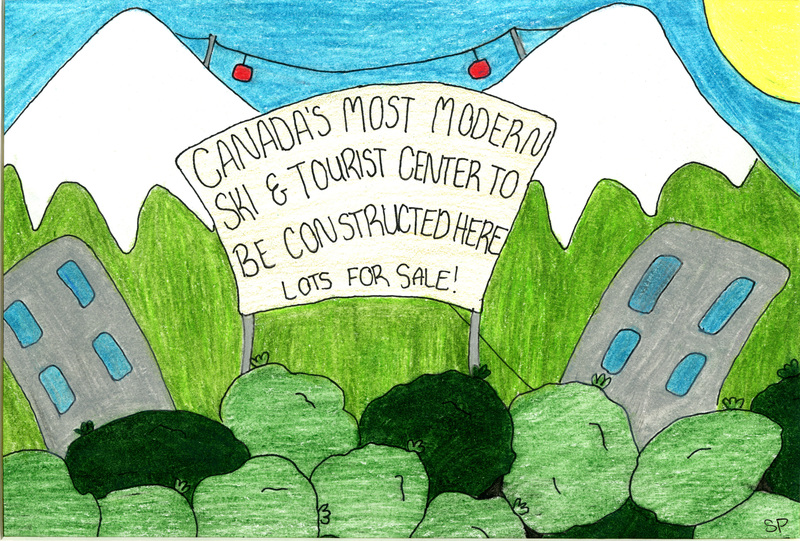 I am happy with my end result of my piece it is a little more cartoon than I usually would do but I think that reflects the fact that Whistler is expanding at a fast rate and will soon be just buildings and fake forests. What historical aspect did you focus on and how did the image inspire you? I focused on the fun and enjoyment that takes place in whistler even though it was many years ago it inspired me that they already had the fun free whistler spirit that people who live in whistler do now. Lana’s inspiration: the classic Myrtle shot. How did you illustrate this visually? 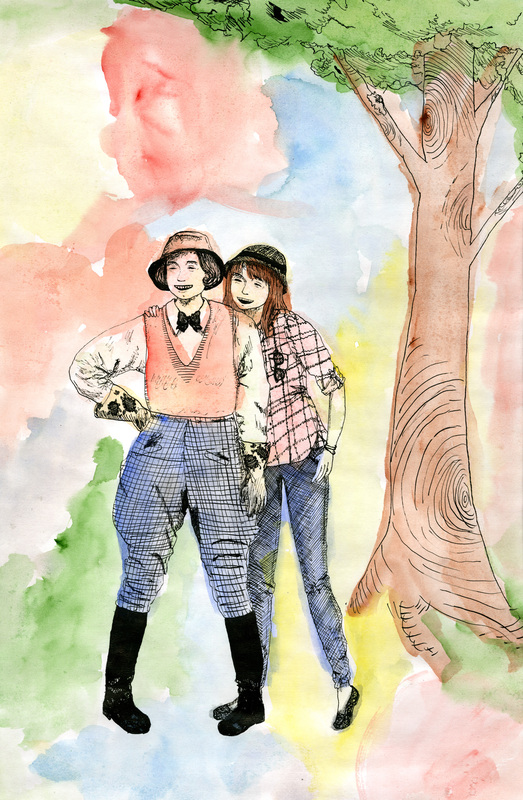 By drawing a stylized version of Myrtle and another girl from our generation in ink. I drew so you cant really tell the difference between them and the time gap between them so you could see that the spirit in whistler has not changed over the years though they are wearing totally different clothes from different generations. I had only inked the people and watercolored the backround because I wanted the people to be the main focus of the drawing and to add bright colors to express the mood and th fun they are having. Your final thoughts? I thought that the project turned out well even though I had no clue what to do in the beginning. I think the colors had helped me a lot in showing the happy, carefree emotions that I wanted to portray. 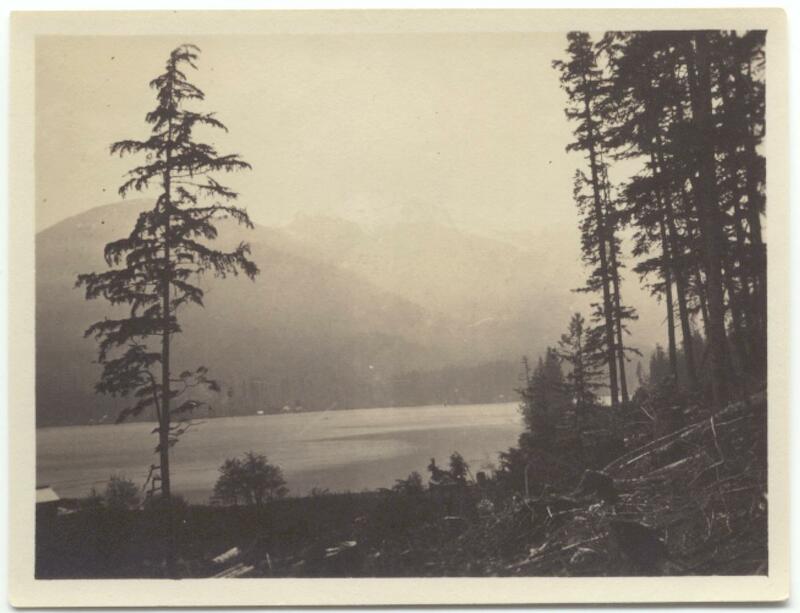 Rinka’s inspiration: Green Lake view, ca 1927. 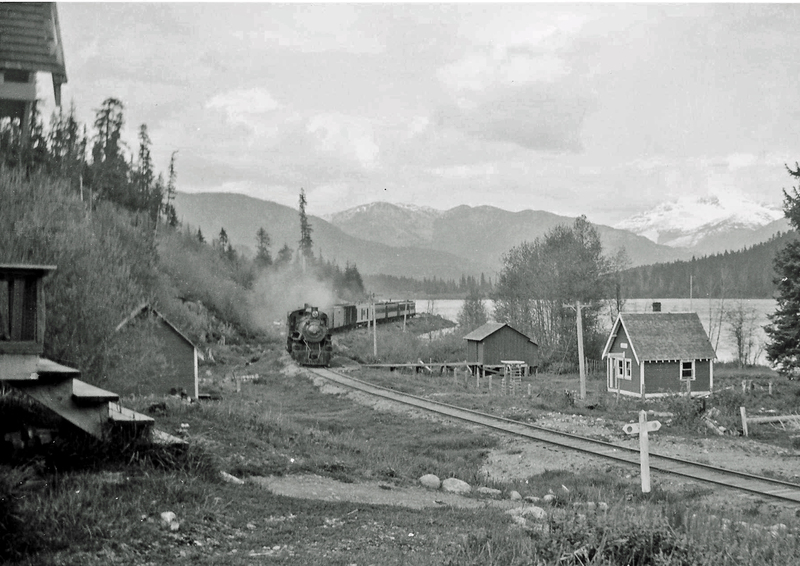 Danielle’s inspiration/raw material: Hustle and bustle at Alta Lake station, ca 1920s. What historical aspect did you focus on and how did the image inspire you? 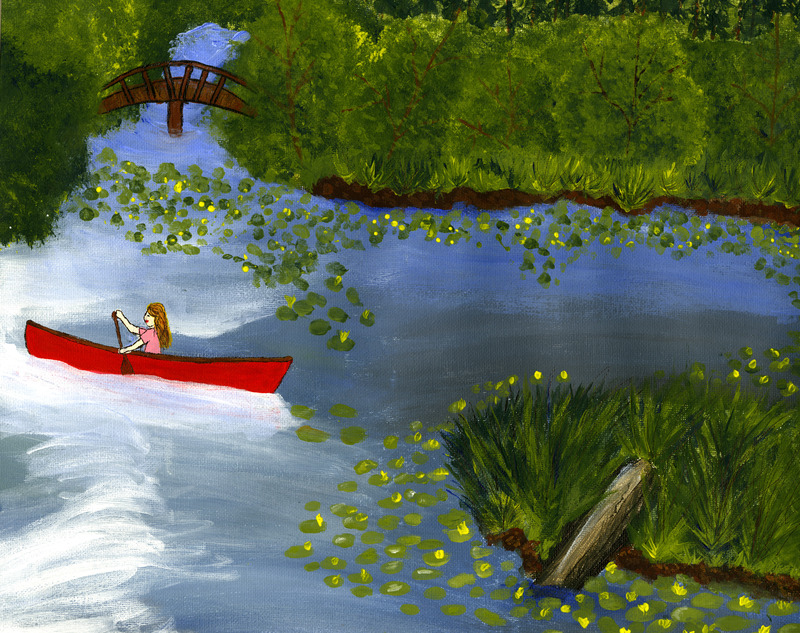 In my piece I decided to portray Whistler as it once was and how is it now. By doing so I split my original photo in half and kept one side as the photo and the other half I drew in pencil. The pencil side of the drawing is similar to the picture copy only I’ve made a few small changes. I’ve made some people less detailed and I colored in the middle woman’s dress in a bright red. I chose red because it stands out well among the pencil and it also symbolizes Canada. My main point I wanted to make was that Whistler was and still is a tourist attraction. What historical aspect did you focus on and how did the image inspire you? I focused on the fact that most of the things that were present in Whistler years ago are still present now. My main focus is skiing, even though the gear and styles have changed, the pure enjoyment of people coming to ski in Whistler is still and will remain the same. Sydney’s inspiration: Freestyle queen Stephanie Sloan. How did you illustrate this visually? I made it clear that the style and era have changed by changing the style and the skis but I made sure to keep the fun aspect of having a great crazy time on our beautiful mountains. 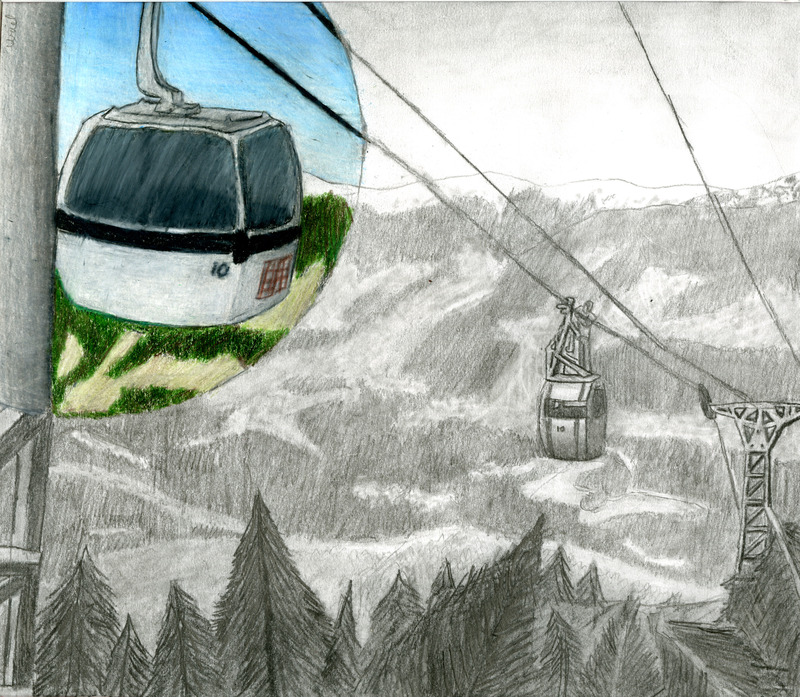 Ever since these mountains were opened, people have been having a great time, and I needed to show that in my piece. Your final thoughts? I think in the end this project was very fun and challenging. Although I wasn’t quite sure what to do when we were given this assignment, I quickly figured it out and I think it turned out quite nice. This piece was modeled after an old photo of the River of Golden Dreams. 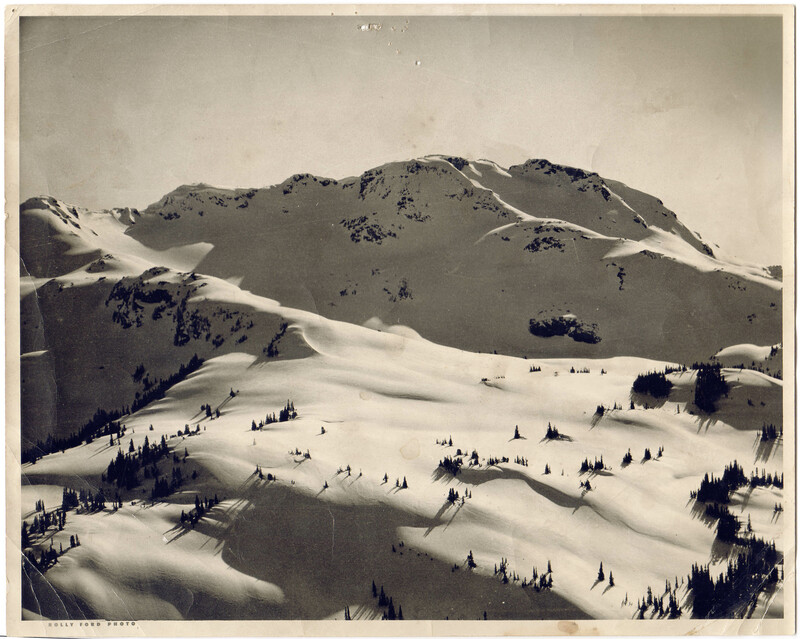 This piece shows that even though Whistler has changed so much, there is always going to be a deep love of the outdoors for those who come here. What historical aspect did you focus on and how did it inspire you? 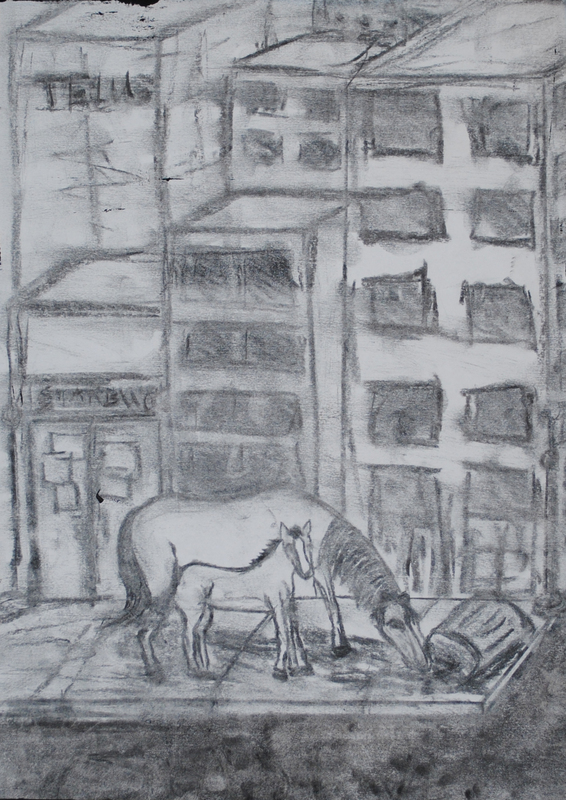 I wanted to present the vast change in transportation over history and also the sadness that came along with the change such as pollution as illustrated with the horse eating the garbage. I wanted to have a dreary look to the image so I used charcoal to create that effect. The image inspired me to really use my creativity and this art assessment really helped me look more deeply into my art piece. Alexa’s inspiration: Mare and fawn at Rainbow Lodge. How did you illustrate your art piece visually? I first draw the piece in pencil. 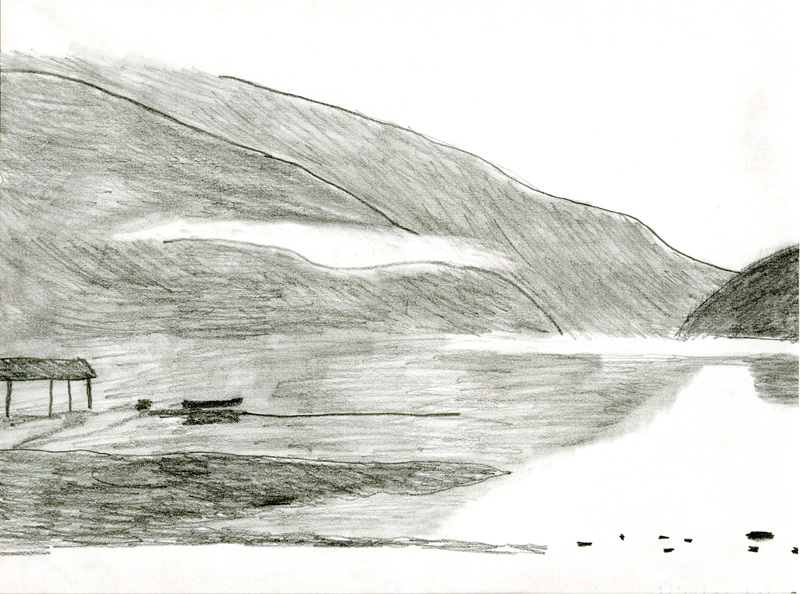 Then, when I was satisfied with the sketch I went over it with charcoal. I then smudged everything all different angles and directions to create a messy effect. The messy effect helped the piece look more lost and foreboding. Your final thoughts? I enjoyed drawing this piece. It was interesting to take an image and change it completely. It was fun to make it my own. I also love horses very much so I had fun drawing the mare and her baby. 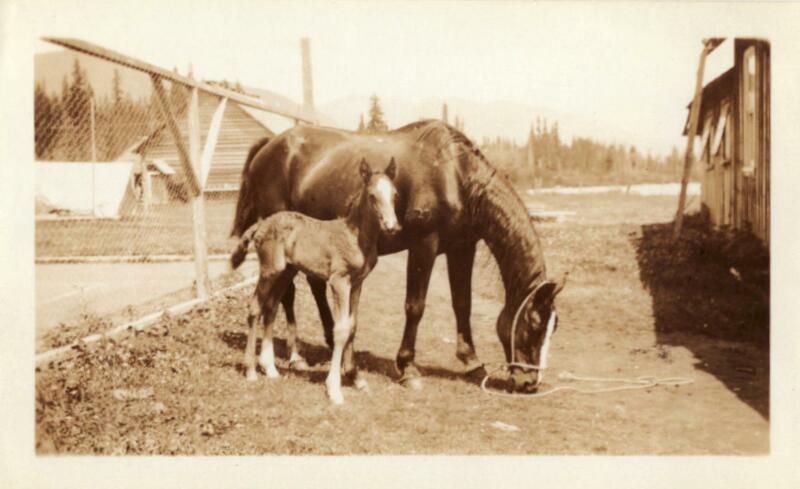 What historical aspect did you focus on and how did it inspire you?I focused on nature history, which was always very important part of Whistler and the way that this community developed. 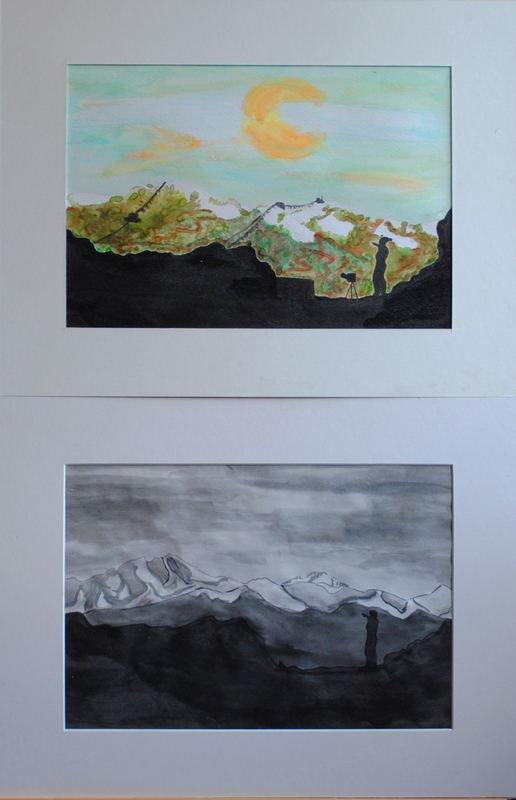 The image inspired me to make two different pieces-one showing mountains in the past and one-mountains today. 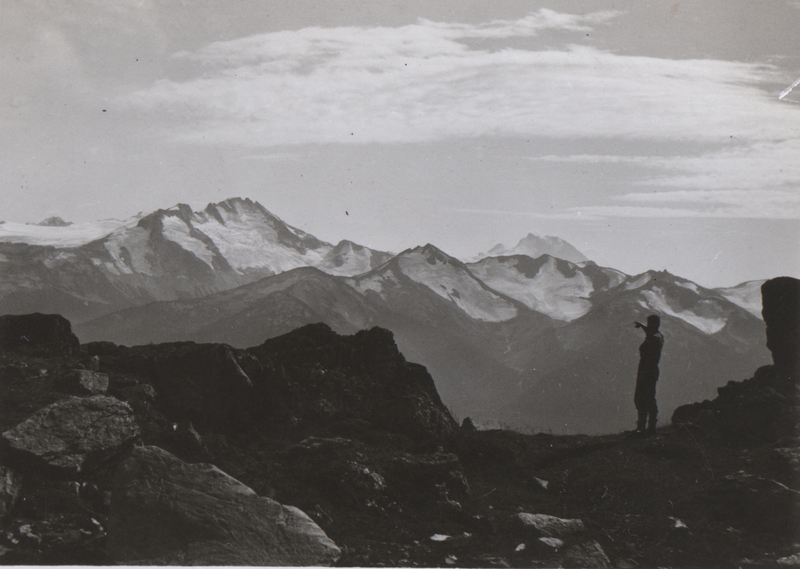 Emila’s inspiration: The view from Whistler Peak, summer 1923. How did you illustrate your art piece visually? 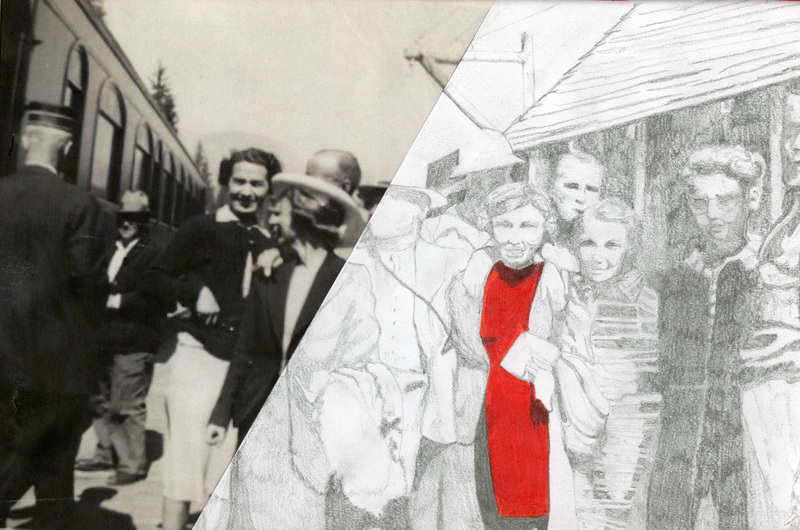 I wanted to show that second image refers to the past by using no colors-just like on the old photos. In second image I used colors and I painted lifts, building, etc. and the person on the painting has a camera with him that very clearly shows that this picture refers to today’s world.